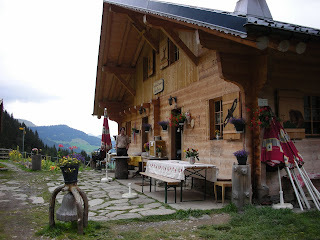 Pretty little chalet that is about a 1.5 hours uphill walk from Champery. They only have a couple of dormitories with mattresses on the floor, capacity about 16 people. When we visited there wasn't a shower - maybe they have added one since. Good dinner and breakfast portions. It's a great place to start either the Tour des Dents du Midi (3 days) or the Tour des Dents Blanches or if coming from the other way a picturesque final rest stop before heading down to Champery. The owner and the staff (2 young ladies) are friendly, the food is decent (warm toast and home made jam made for a good breakfast). Great view of the Val d'Illiez and the Dents du Midi - specially the walk to Cabane de Susanfe.